Man, oh man! 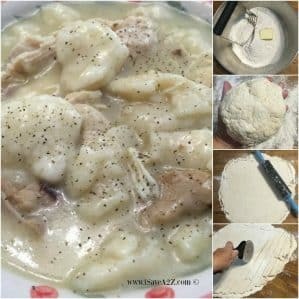 If there is every a simple recipe to try it would be this Cracker Barrel Chicken and Dumplings Copycat Recipe. 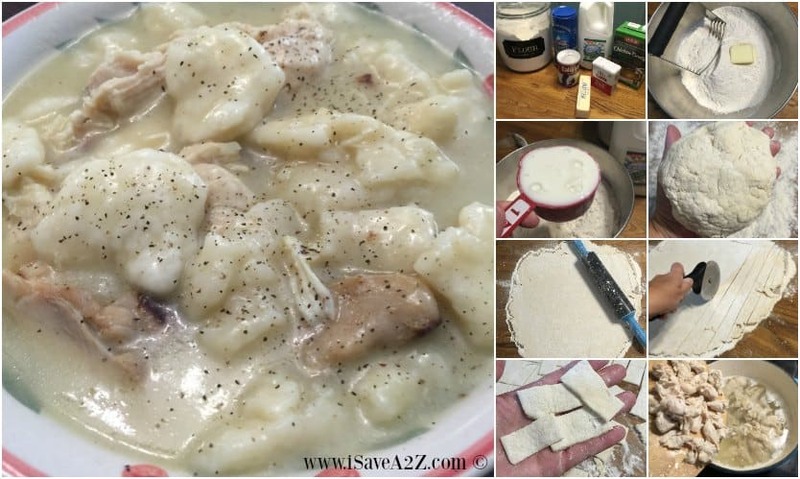 I was able to make this meal from frozen chicken to done in a little less than 30 minutes! I made this recipe with a bag of frozen chicken breast tenders. I totally forgot to defrost something for dinner. My mind was elsewhere obviously. It wasn’t until about 2 hours before dinner time that I remembered what I forgot. I ended up boiling the bag of chicken tenders to start my broth mixture and cook the chicken. Chicken always comes out so tender when you boil it. The weather is starting to cool down (Thank GOD!) here in Texas so I am happy to start making dumplings again! 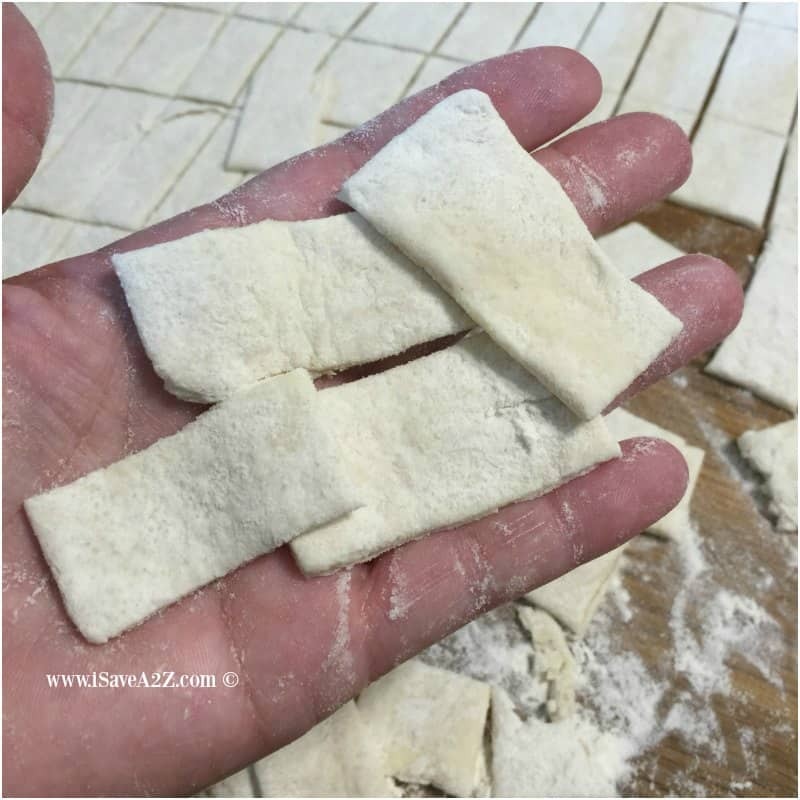 We have made many different versions of dumplings but this recipe might just be my fav! I might just be saying that because it’s so darn easy. I live for easy now-a-days. Who doesn’t, right? I started this recipe by boiling my chicken first. After the chicken was completely cooked, I removed the cooked chicken and shredded it into smaller pieces. I set it aside to make the dumplings. This created my broth. You can use leftover chicken for this recipe also. If you don’t boil your chicken, or are using leftovers, you can heat up 2 quarts of chicken broth you purchase from the store. Or, add a bit of Better Than Bouillon Chicken Base. (not all stores carry this but you can grab a can on Amazon) This stuff is amazing and gives it such a good flavor. In fact, even when I boil my own chicken I spoonful of this stuff for extra flavor! Combine the flour, baking powder and salt in a medium size bowl. 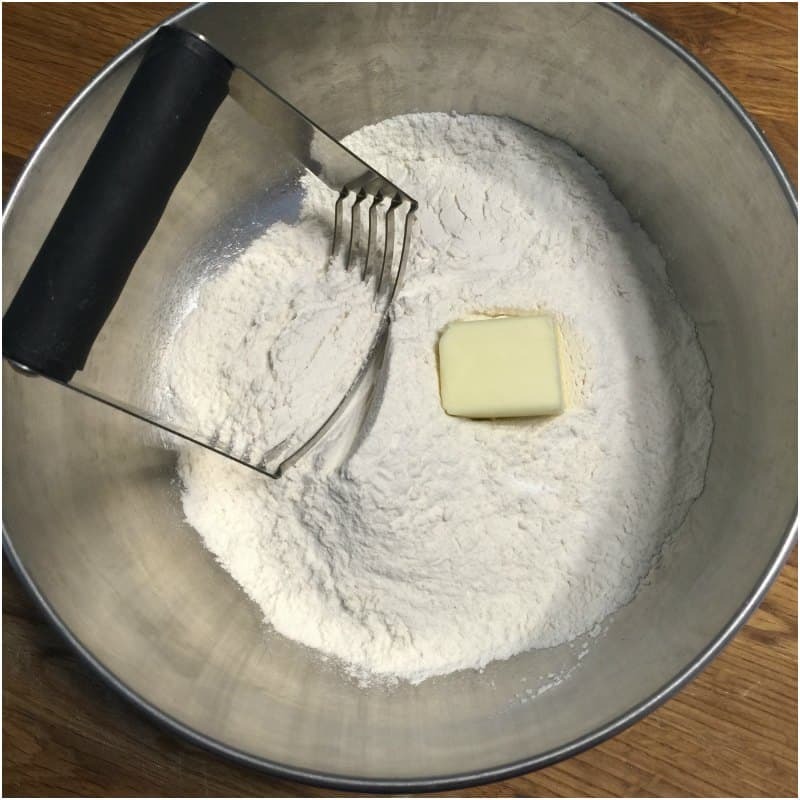 Cut the butter into the dry ingredients with a fork or pastry cutter. The pastry blender is easy to use especially when the butter is rock hard. If you don’t have one, get one! Stir in the buttermilk with a fork until the dough forms a ball. Heavily flour a work surface. The ball of dough will be a bit sticky and you don’t want it sticking to your counter. You’ll need a rolling pin and something to cut the dumplings. I like to use a pizza cutter. 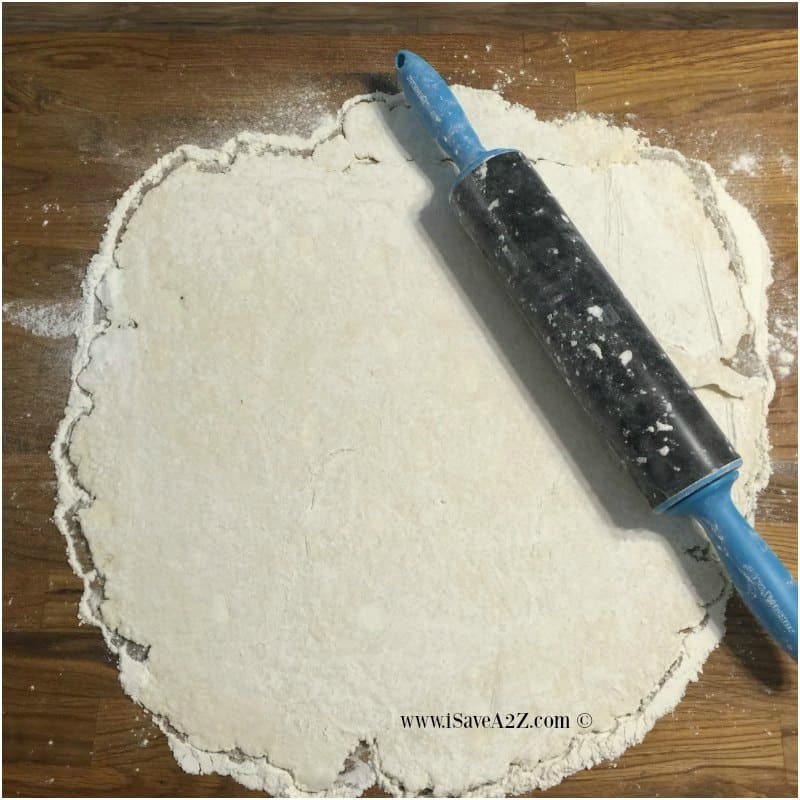 Roll the dough out thin with a rolling pin. 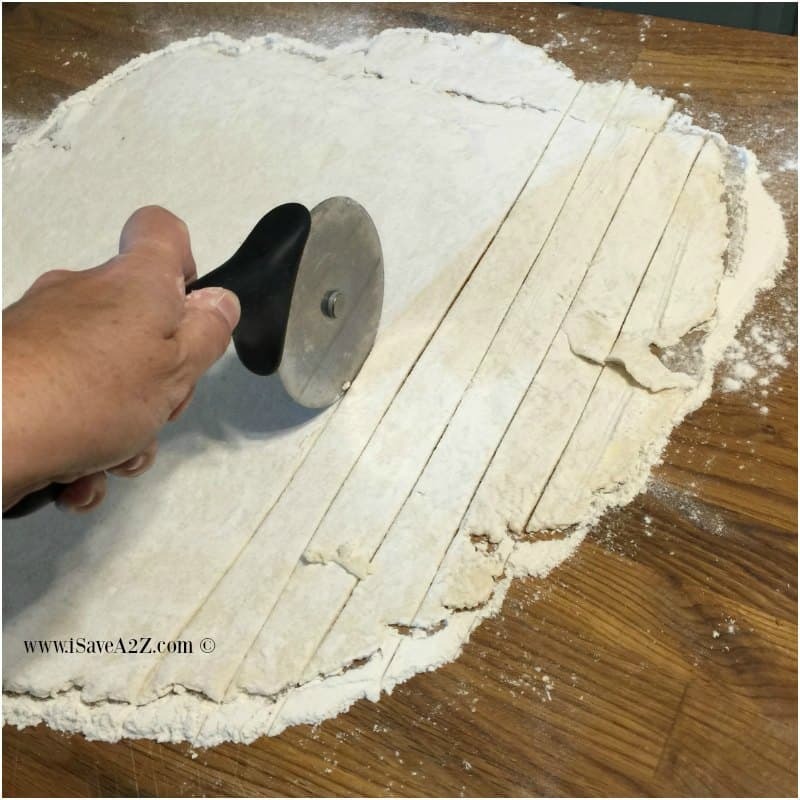 Be sure to dust your rolling pin with flour before you use it to prevent sticking. 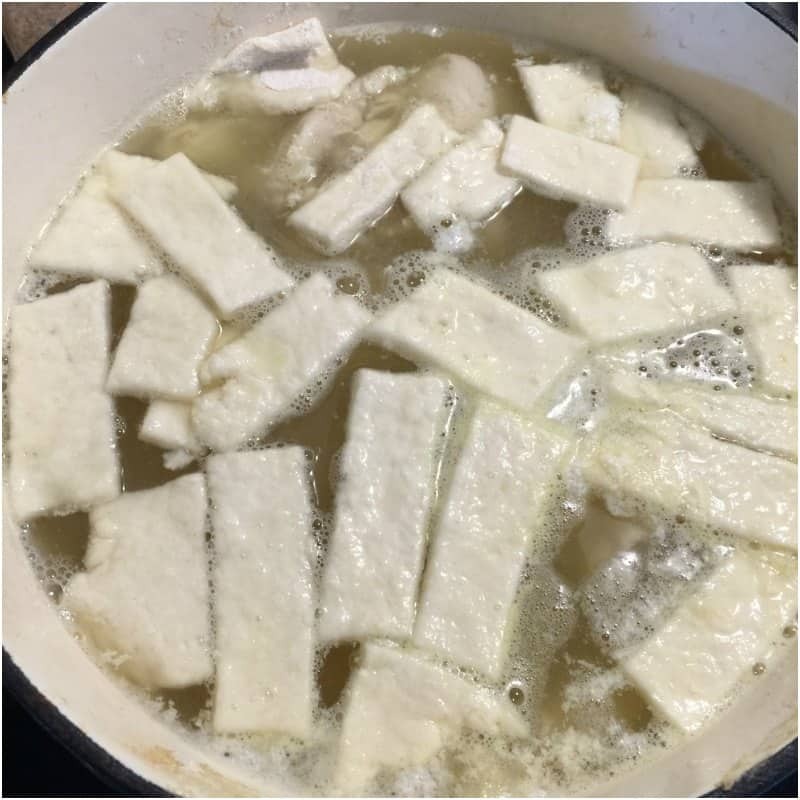 Now cut the dumplings in squares about 2 inch strips as seen in the photos. These do not have to be perfect by any means. You want them all about the same size so they will all cook the same. Next, I use a spatula to put them back in the bowl the dough just came from. I’m all about messing up less dishes so I have less to clean up. 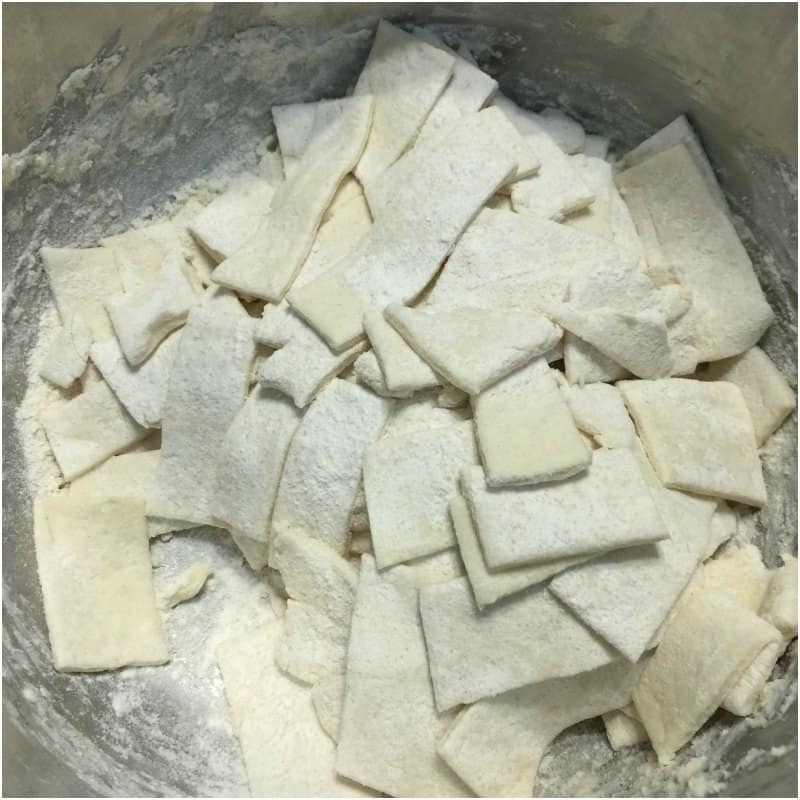 When you pick up the dumplings, if you notice any sticking you may want to dust them with a little bit more flour so they don’t stick. Don’t worry about using too much flour though. The extra flour dust helps create the thicker soup sauce. To cook them, bring the broth to a boil. Drop the dumplings in a small amount at a time, stirring while you add them. The extra flour on them will help thicken the broth. Cook them for about 15-20 minutes or until they not doughy. Add the cooked chicken to the pot and Voila! Dinner is done! Here’s a printable version of this recipe for you! You can use leftover chicken for this recipe also. 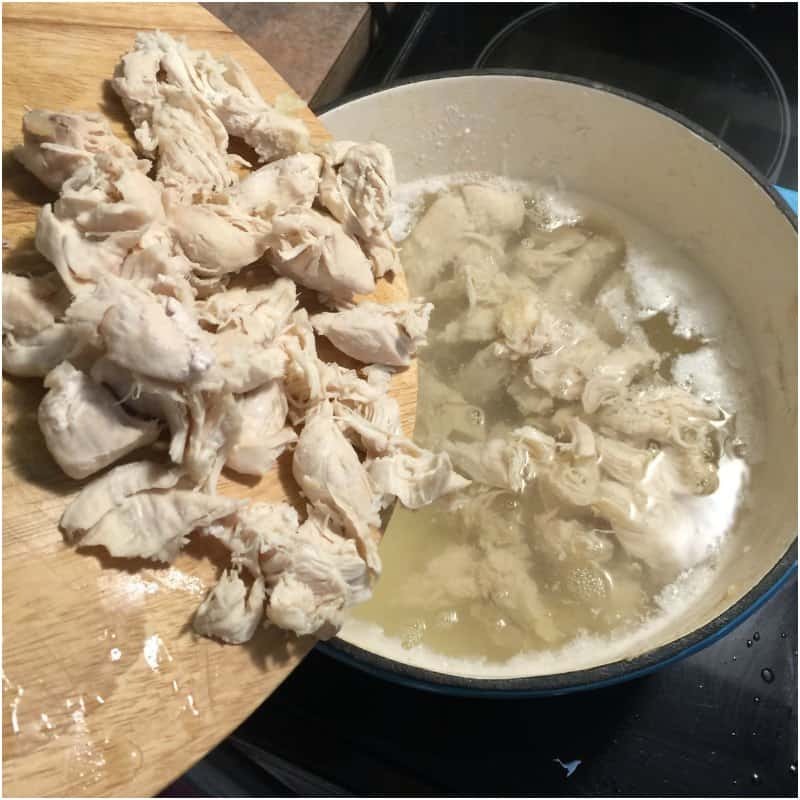 If you don't boil your chicken, or are using leftovers, you can heat up 2 quarts of chicken broth you purchase from the store. Or, add a bit of Better Than Bouillon Chicken Base. (not all stores carry this but you can grab a can on Amazon) This stuff is amazing and gives it such a good flavor. In fact, even when I boil my own chicken I spoonful of this stuff for extra flavor! Cut the butter into the dry ingredients with a fork or pastry blender. The pastry blender is easy to use especially when the butter is rock hard. Heavily flour a work surface. 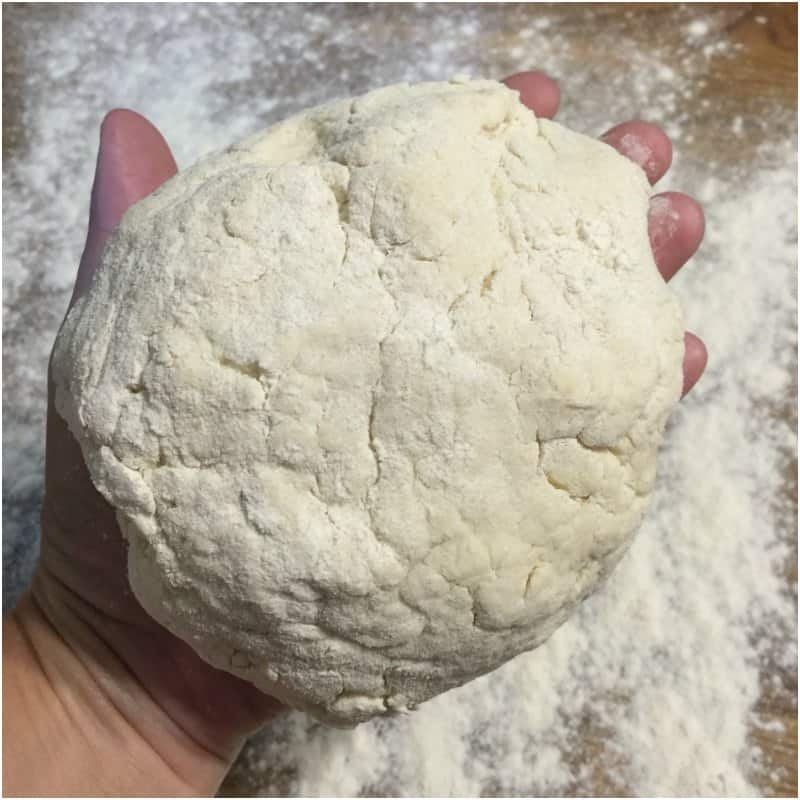 The ball of dough will be a bit sticky and you don't want it sticking to your counter. You’ll need a rolling pin and something to cut the dumplings. I like to use a pizza cutter. Next, I use a spatula to put them back in the bowl the dough just came from. I'm all about messing up less dishes so I have less to clean up. When you pick up the dumplings, if you notice any sticking you may want to dust them with a little bit more flour so they don't stick. Don't worry about using too much flour though. The extra flour dust helps create the thicker soup sauce. 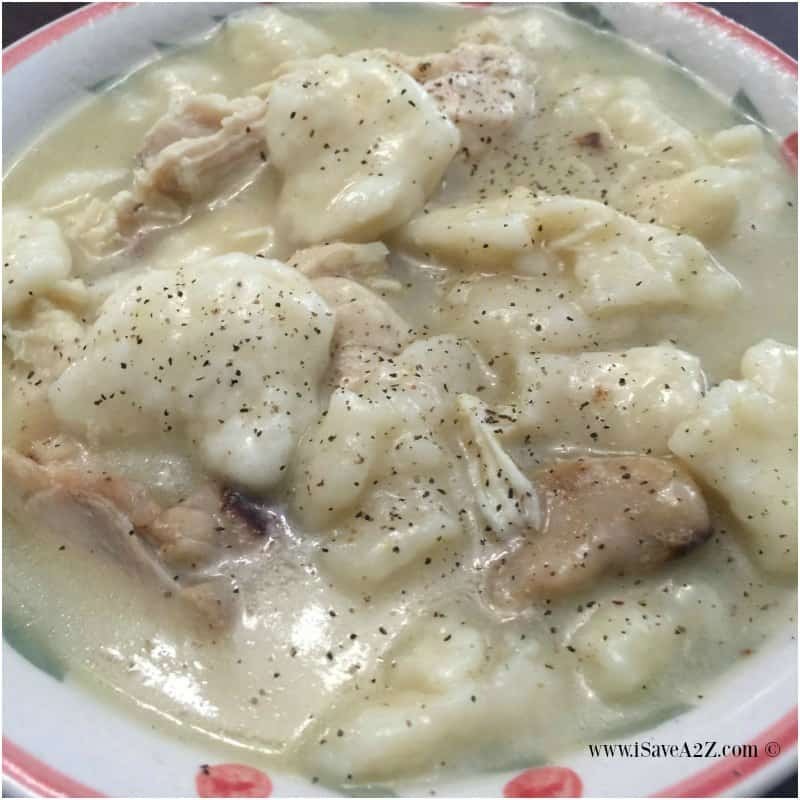 By Megan on September 28, 2016 Chicken recipes, Main Dishes, Recipes. really really good! thanks for the recipe, spot on for dinner tonight! Thank you for making these. I hate the home-style drop biscuit style dumplings but love the flat square kind’s that you get at restaurants. These are spot on!